, a political character of considerable fame in Scotland, was the descendant of an ancient family, and born in 1649 at Cathcart in Glasgow. He was educated in divinity and philosophy at Edinburgh and Utrecht, to which his father sent him that he might avoid the political contests which disturbed the reign of Charles II. but he had a zeal which prompted him to interfere in what regarded his country, although removed from it, and he must have given some proofs of a talent for political affairs at a very early period. When England was alarmed about the popish succession, Carstares was introduced to the pensionary Fagel, and afterwards to the prince of Orange, and entrusted with his designs relating to British affairs. During his residence in Holland, his principles both in religion and politics, were strongly confirmed; and upon his return to his native country he entered with zeal into the counsels and schemes of those noblemen and gentlemen who opposed the tyrannical measures of government; and although about this time he took orders in the Scotch church, his mind seemed to have acquired such a decided bias towards towards politics, that he determined to revisit Holland. On his way thither he passed through London, and was employed by Argyle, and the other Scots patriots, in treating with the English, who were for excluding the duke of York from succession to the crown. Towards the close of 1682, he held various conferences with the heads of that party, which terminated in his being privy to what has been called the “Rye-house plot.” Accordingly, he was committed to close custody | in the Gate-house, Westminster. After several examinations before the privy council, he was sent for trial to Scotland; and as he refused to give any information respecting the authors of the exclusion scheme, he was put to the torture, which he endured with invincible firmness, but yielded to milder methods of a more insidious nature, and when a pardon was proposed, with an assurance that no advantage should be taken of his answers as evidence against any person, he consented to answer their interrogatories. The privy-council immediately caused to be printed a paper, entitled, “Mr. Carstares’s Confession,” which contained, as he said, a false and mutilated account of the whole transaction; and in direct violation of their promise, they produced this evidence in open court against one of his most intimate friends. This treachery and its conquences very deeply affected him; but as soon as he was cleared, he obtained permission to retire to Holland, towards the close of 1684, or the beginning of 1685, where he was kindly received by the prince of Orange, who appointed him one of his chaplains, caused him to be elected minister of the English protestant congregation at Leyden; and when the prince determined to transport an army to England, Carstares accompanied him as his chaplain, and continued about his person till the settlement of the crown. 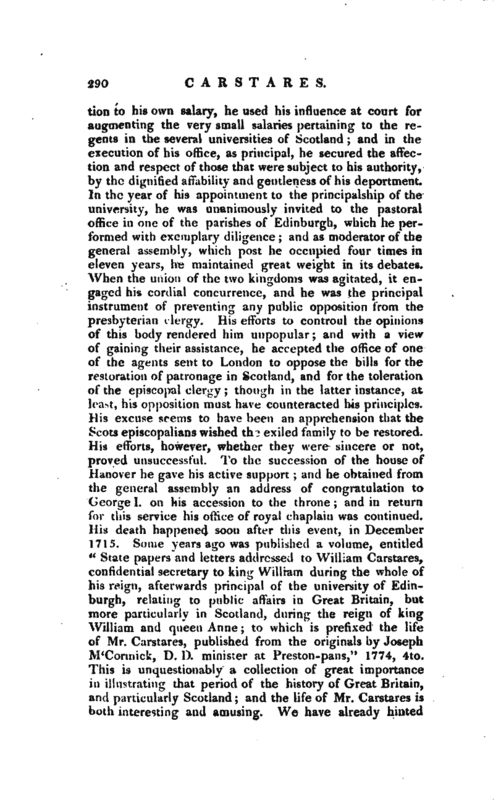 During the whole of this reign he was the chief agent between the church of Scotland and the court, and contributed by his influence with the king to the establishment of presbytery in Scotland, to which his majesty was disinclined, and to a degree of coalescence or accommodation on the part of the presbyterian clergy with the episcopalians. 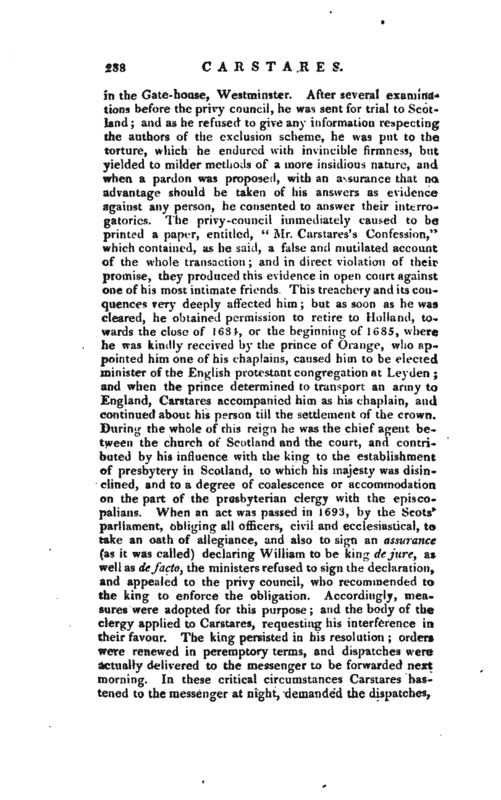 When an act was passed in 1693, by the Scots* parliament, obliging all officers, civil and ecclesiastical, to take an oath of allegiance, and also to sign an assurance (as it was called) declaring William to be king dejure, as well as de facto, the ministers refused to sign the declaration, and appealed to the privy council, who recommended to the king to enforce the obligation. 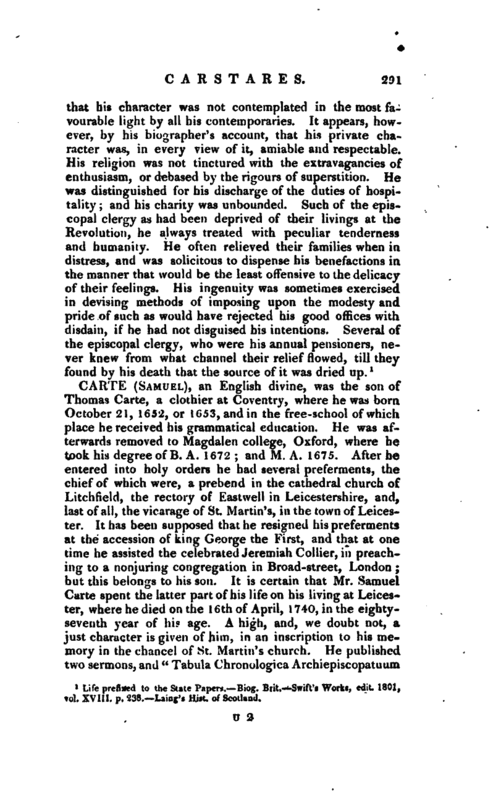 Accordingly, measures were adopted for this purpose; and the body of the clergy applied to Carstares, requesting his interference in their favour. The king persisted in his resolution; orders were renewed in peremptory terms, and dispatches were actually delivered to the messenger to be forwarded next morning. In these critical circumstances Carstares hastened to the messenger at night, demanded the dispatches, | which had been delivered to him in the king’s name, and instantly repaired to Kensington, where he found his majesty gone to bed. Having obtained admission into his chamber, he gently waked him, fell on his knees, and asked pardon for the intrusion, and the daring act of disobedience of which he had been guilty. The king at first expressed his displeasure; but when Carstares further stated the case, his majesty caused the dispatches to be thrown into the fire, and directed him to send such instructions to the royal commissioners of the general assembly as he thought most conducive to the public good. In consequence of this seasonable interposition, the oath and assurance were dispensed with on the part of the clergy. 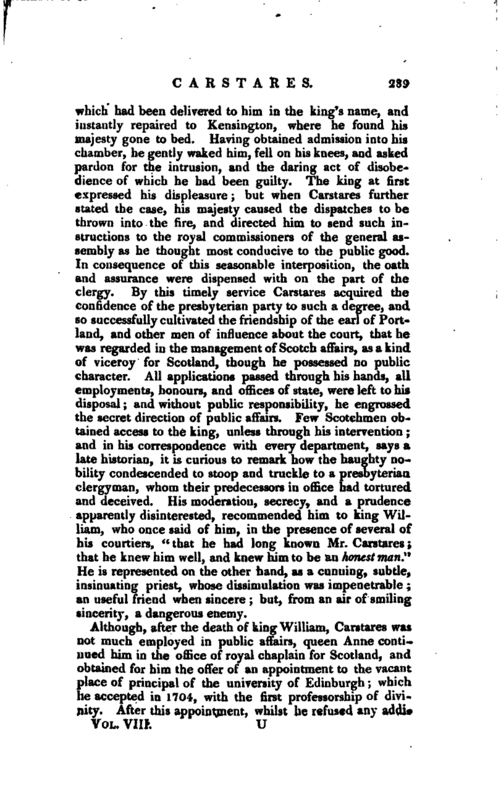 By this timely service Carstares acquired the confidence of the presbyterian party to such a degree, and so successfully cultivated the friendship of the earl of Portland, and other men of influence about the court, that he was regarded in the management of Scotch affairs, as a kind of viceroy for Scotland, though he possessed no public character. All applications passed through his hands, all employments, honours, and offices of state, were left to his disposal; and without public responsibility, he engrossed the secret direction of public affairs. Few Scotchmen obtained access to the king, unless through his intervention; and in his correspondence with every department, says a late historian, it is curious to remark how the haughty nobility condescended to stoop and truckle to a presbyterianx clergyman, whom their predecessors in office had tortured and deceived. 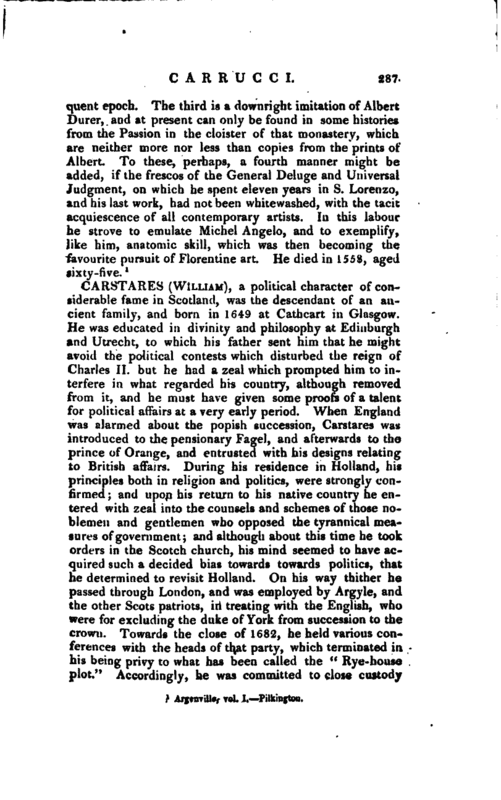 His moderation, secrecy, and a prudence apparently disinterested, recommended him to king William, who once said of him, in the presence of several of his courtiers, “that he had long known Mr. Carstares; that he knew him well, and knew him to be an honest man” He is represented on the other hand, as a cunning, subtle, insinuating priest, whose dissimulation was impenetrable; an useful friend when sincere; but, from an air of smiling sincerity, a dangerous enemy. 1 Life prefixed to the State Papers. Biog. Brit, Swift’s Works, edit. 1801, vol. XVIII. p. 238. Laiog’s Hist, of Scotland.